Whether you gave 2 weeks’ notice or walked out the door that day, it was time for you to embark on a new chapter in your career: entrepreneurship. Then it hit you! I don’t have a plan. How am I going to feed myself? How am I going to take care of my family? What am I going to do? First, you’re going to calm down and honor your feelings. You quit for a reason. Something wasn’t working, so you listened to your gut. But you need a plan if you’re going to make this work. This checklist is a starting point. In it, I list 10 things you can do right now to quickly identify your strengths, set your rates and start getting clients. 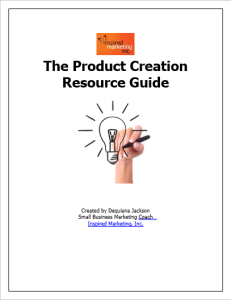 This valuable, 16-page guide is only 99 cents! 5 ways to instantly enhance your credibility…even if you haven’t had a single customer! Even the best business ideas can fail if no one knows about them, but many small businesses still have no marketing budget or plan. Think you don’t have the time to craft a proper plan? Well, think again. The“Build Your Marketing Plan in One Week”e-book is for you! This e-book walks through seven days of marketing planning, with each day building upon the previous. Learn how to find your target consumer, uncover the strategies of the competition and discover how to give your business a unique edge. By the end of one week, you will be able to write a marketing plan that you can immediately put into action. Learn more about the Get the SPARK™! Small Business Marketing Bundle!